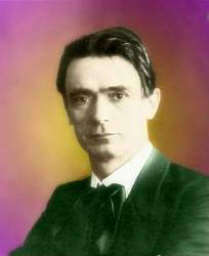 Readers, especially those of you new to Rudolf Steiner's works, you may experience some uncertainty as you begin this review. Take comfort. This footnote(1) describes someone who did and yet kept reading. It was on the first anniversary of the cataclysmic events of September 11, 2001 when I opened this book to begin reading it, maybe because it was clear to me that the destinies of individuals and nations were in the balance and were being weighed as to possible outcomes at this time. This series of lectures was given at a time when an early battle of the Great War, later to be re-named the First World War after the Second World War came into being, was taking place within view and earshot of Rudolf Steiner as he stood beside the Goetheanum building project in Dornach which looked out over Upper Alsace. This book is filled with poems and prayers, especially poetic sentiments and prayers for those who were on the field of battle and for those who had already given their lives in battle. The poem that ended each chapter appeared twice. Steiner spoke it once for those embattled and once more for those lost in battle. As I read the poem, I could not help but think of those who are battling the war on terrorism around the world for the forces of freedom and those 3,500 plus souls who lost their life on that now infamous day, September 11, 2001, which has taken on the sobriquet, 911. I note from the etymology of sobriquet that its French origin means, "a tap under the chin." In American parlance we received a sucker punch that day, an uppercut, a tremendous "tap under the chin" that sent us reeling back on our heels. The battleship Maine in Havana harbor, the Pacific Fleet in Pearl Harbor, all the other opening shots in previous wars paled in comparison to the events of that day. Americans began buckling on their shoulder packs on that day and saying to each other, "Let's Roll!" — the words of the hero of Flight 93, Mark Bingham, who urged passengers to crash the plane into a Pennsylvania open field rather than allow it to bomb another target in Washington, D. C.
To those whom you guard here on earth. For the souls it seeks out there in love. Rudolf Steiner spoke these words in every lecture he gave in this series, often twice at the beginning and twice at the end of the lecture. If anyone wanted to know how Steiner prayed when he said his prayers, one need look no further than this prayer above. [page 3, 4] Today we are once again living in a time where people have come together from many different parts of the world through the spiritual movement we have made our own, and because of the feelings they have experienced, because of something that deeply unites them from the very depths of soul, they have come to call one another brothers and sisters. And once again they have to stand on opposite sides. The karma of mankind demands this. . . . This means that we may have faith in our hearts that events will take the right course with world karma — that there has to be strife, that blood and more blood has to be shed, in order to achieve what he who guides the destinies of the world wants to achieve for mankind and for earth. It will again be the blood of sacrifice, the sacred blood of sacrifice. And those we love who are going to shed this blood of sacrifice shall be powerful helpers for mankind in the realms of the spirit, for the best and most sublime of goals. To do his work within the world. The suffering your own body undergoes. We hear a lot about "ages" of the world, and there seems to be no agreed upon operational definition that one can apply to discover what an age of the world is. This is even more difficult when we talk about the spirit of the age, but Steiner provides some guidance in this process of approaching the spirit of the age. "How do we know we are addressing the right spirit?" we may ask, and Steiner says, "We will know if we approach this spirit in a way that is in accord with the true Christ impulse." The impulse that informs the above stanza. And this spirit is in dialogue with Christ. [page 8] This spirit is holding such a dialogue with the Christ in the spiritual world now — so that out of the purpose for which battles are fought and blood is shed the right thing may come for the good of mankind. The concept of evil can be difficult to grasp until one stumbles upon Steiner's simple operational definition of evil as "a good out of its time." Then every evil, from the smallest to the largest can be seen in its proper perspective. To demonstrate that process, let's take the greatest evil, the Fall of Humankind. It stemmed from the act of the archangel Lucifer who, tired of acting as a mere conduit for the Light from the Godhead, decided to take what light he possessed and share it with human beings on Earth. Light that humankind was destined to receive in proper time was given over out of its proper time — a good was bestowed before its time and thus became an evil by the operational definition of Steiner. From that cosmic event of the Fall has proceeded all of the lesser evils that have beset humankind since all of the evils, rightly understood, are goods out of their time. [page 8] We speak of Luciferic and Ahrimanic spirits in exactly this way, knowing that they are now at an age when it is not right for them to develop something that during the right epoch would be the proper thing for the evolving world. This is why we speak of the age of a spirit when we mean its essential nature. In this early century when nationalities are doing battle with each other, it will be good to remember that when we each pass through the gate of death we will cast off everything we know to be connected with nationality. In fact, in successive lifetimes, we will each be members of different nationalities. Thus, it can be seen that a world karma is at work today which would cause these spirits to feel enmity to others whose nationality they shared during previous incarnations. Like pickup games of football in the vacant lot, the team you fight for today is composed of teammates from the previous day's battle. And the team that you fight against in today's battle will be the team that you fight for as earnestly in tomorrow's battle. In my childhood, we showed up each day because we loved our teammates and we loved the game we played together, and yet we did battle against each other as the teams and the battle lines were chosen by lots. This was a lesson I learned over and over again as a child in playing our games of war: whether it was cowboys vs. Indians, cops vs. robbers, or shirts vs. skins. Enemies today were friends yesterday. And we loved each other outside of the game and we loved the game we played together. Paradoxically, we learned about love by playing at war. Apply this insight now to the war mongers who want the USA to wage war against Iraq in the current time, and to the Arabs whose enmity and dastardly deeds started the current war by killing innocent civilians. [page 15] Consider some real 'nationalist' today, someone with national feelings who directs his antipathy very particularly against the members of another nation and, indeed, may be ranting and raving against this other nation in his own country. What is the meaning of such ranting and raving, of such antipathy? 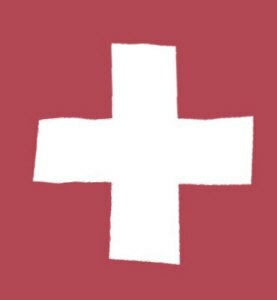 It signifies a premonition — My next incarnation will be into this nationality! In other words, our "I am" has already established a path to this nationality in our next incarnation and, since this higher self is resisted by the materialistic part of ourselves, whatever we resist most strongly is what we are doing outside of our awareness. This is a process that I called the "Mirror Whammy" about twenty years ago when I first stumbled upon the insight in my own life. Now I find it elaborated by Steiner as affecting humans between lifetimes. What you fight against most earnestly is what at a deep level you love. This may be hard to accept, but consider that a component of fighting is the transfer of power to the one that you fight. Normally we only consider that transferring of power is something that we do to those that we love deeply, as when a parent leaves a legacy to an offspring or a teacher to a prized student. But if we add to our understanding that during a fierce battle with someone that you transfer some of your power to the other person, the hate that led to the battle can be seen at a deeper level to be the result of a deep love for the other to whom you will transfer this power. [page 17] We shall then understand how earth man, having eternal man within him, does not want what the eternal man within him wants; how the love he must feel in eternity is in the temporal world transferred into hatred. The second movie of Harry Potter has just been released, "The Chamber of Secrets", and when I watched the movie, a point that had earlier eluded me, stuck with me this time, perhaps because I was in the middle of reading this book I am reviewing herewith. And it is pertinent to this discussion of battles and transfers of power. Harry is revealed to be a "parcel-mouth" which is the name for someone who can speak with snakes. It is the Hogwarts Headmaster Dumbledore who at the end of this movie tells Harry how he came to have this power. When Harry was a baby, he received the lightning scar on his forehead because Lord Valdemorte was angry at him and tried to kill him. During this feat of anger, the Dark Lord, who possessed the ability to speak with snakes, transferred some of his power to Harry. This feat may be seen, in light of this insight, as a feat of love in eternity which in the temporal world appeared to be a feat of hatred. Hate, seen in the big picture, reveals itself as love. This ambiguity or inter-relationship of love and hate — often called a "love-hate relationship" — is used by detectives to investigate and solve crimes of murder with great success. Steiner gives us insight into how the national elements find their expression in the soul, and these are shown in the Table below. He gives many details about how these play themselves out in events in pages from 14 to 31, the end of the lecture. To mention a few of the things he mentions how Frederick the Great and Leibnitz, while both very Central European, both spoke and wrote in French, showing how the Ego relates to the Intellectual Soul. The Central European, the German or Scandinavian, is caught up in thought whereas the Frenchman has thoughts. The British with their national element of Consciousness or Spiritual Soul are what Steiner calls "onlookers" and the greatest portrayer of British traits to his mind was Shakespeare. The Italian on the other hand is so concentrated in the Sentient Soul as to see another person who is not Italian as a foreigner who is living abroad and sees homeland as something to be preserved. All the battles in Italy in the 19th Century, Steiner tells us, had to do with home territory. [page 21] To sum up all the connections Steiner makes, I offer another more detailed Table, which we can see the corollaries to how the Italian feels to how natives of the other countries feel according to their particular soul element shown in the Table above. [page 23] And so the person who is a foreigner to the Italian, a barbarian to the Frenchman, a rival to the Briton and an opponent to the German is a heretic in Russia. [page 27] I have tried to find a succinct formulation for the feelings different nations may be seen to have towards war, saying that a Russian believes he is going to war for the sake of religion, an Englishman for competition, a Frenchman for the glory, an Italian or Spaniard for his homeland and a German to fight for existence. Steiner tells us that the folk spirit or folk soul lives specifically in our etheric body and thus we live within this folk soul during our waking hours. But what about when we are sleeping? Then we enter into a dance with other folk souls, all the other folk souls, that is, unless we harbor a hatred towards a particular nation, in which case, we will find ourselves living during sleep within that one folk soul. During my reading of this book, I was often filled with inspiration to write poems about certain insights that came to me. This passage triggered the first poem which I call "The Death of Love." [page 38] This at the same time lends significance to the hero's death, on the field of battle for instance, a significance that is felt. Any who feel it in the right way — and those going through such a death in the right frame of mind surely will feel this — will know that this death is a death of love. It is not suffered for personal reasons, not for the things one can keep with one for the whole period between death and rebirth — it is suffered for the folk soul, in that this physical and ether body is given up selflessly. It is impossible to think of death in battle without knowing that is filled through and through with genuine and most heartfelt love, with men being upheld by something that contributes to the future good of mankind. That is what is so great, so utterly tremendous in this death on the field of battle, if it is experienced in the right frame of mind. He leaves us with a death of love. [page 41] Do not think that it is possible to generalize and say: 'It is easy to arrive at spiritual truths by always thinking the opposite of what is happening on the physical plane'. If that were made the rule we would get the most silly and erroneous results. For it may hold true in five out of a hundred cases, but not in the other ninety-five. All spiritual truths are individual and have to be considered individually! They cannot be determined by mere dialectics. [page 43] A person going through the gate of death without having made use of the opportunity to take in spiritual elements that exist in our time hands over his souls to the higher worlds on passing through the gate of death in almost the same state he received it when he went through birth to enter physical existence. The higher worlds receive nothing from him but what they have given him on his incarnation. The Biblical passage in Matthew 25:14-28 of the servants and the talents seems applicable here. Each of the servants who had invested the talents they were given for safekeeping by the Master, returned more than they were given and praised. The servant who was only given one said to the Master, "I was afraid, and went away and hid thy talent in the earth: lo, thou hast thine own." The Master was furious and had that talent taken away from him and given to the servant who had ten. When we come to Earth, we have the choice whether to hide our talents in the ground or invest them so as to multiply them upon our return to the spiritual world. The parable shows that the reception we receive depends upon choices we make. This next long passage gave me to think that if there is 'wood in the word' there can be a bonfire, a good fire, blazing in our hearts. [page 44] This is something I hope will always shine through in all our discussions of the spiritual knowledge we are seeking: that this spiritual science is a living, active force. I am not talking about visions; I am talking of the results coming alive in man. Spiritual science is something alive, something active, that takes up its abode in our souls, that is working and active in our souls. I have often used the comparison that merely to speak of love — considering particularly the talking that goes on in the theosophical movement — is like standing in front of a stove and preaching that it shall grow hot, this being its duty as a stove. Even the best of sermons concerning its responsibilities as a stove will not make it grow hot. It will grow hot, however, if we put some wood in it and put a match to it. Basically that is how it is with all preaching of human love, and such preaching will prove hardly more successful when directed at men than a sermon directed at the stove, telling it to grow hot. Such preaching has been done at all times and the results can be seen. But anything that is not mere knowledge of the spiritual world, not mere idea, mere word, but is instead something alive, something active in the word, that is the wood we give to our soul, and it will burn if it is rightly taken in by the soul. This can be learned particularly from conflicts like the present one. There knowledge is set aflame, knowledge becomes love, for man is transformed by the spiritual life he has recognized in his depths, in his foundations. This profound transformation is indeed most uncomfortable for him; he rejects spiritual truth and would rather remain in Maya. Basically, that is also the next reason for the often-heard statement that spiritual truths should not be offered too freely to the public. After all, these are not truths that act as neutrally as physics or chemistry when they are spoken, but truths towards which the human soul cannot maintain a wholly neutral attitude, having to either reject them or take them in. To take them in, however, the soul has to change in a certain way from what it is in ordinary physical life. So it is true that the world does get somewhat stirred up, excited, when the deeper spiritual truths are presented. Yet our age is ordained not to shrink from such excitement and really to go through this excitement. This will be the only way of preparing the ground for a new spiritual life, a spiritual life we must live towards, for we are now indeed at its starting point. And set it afire thereon. before my stove, was warm. before my word, was warm. before my soul, was warm. The old approach to figuring out the reasons to wars and conflicts involved endless debates over "Who did it?" Steiner tells us that the time will come for us to make an effort to go deeper if we are to learn to speak of these events in the right way. [page 46] The time will come when the deeper truths relating to karma will have entered into the hearts and minds of men. Then this way of blaming the other for whatever has to be lived through will no longer exist. Then people will know that every nation is, in its karma, living through the things it has to live through for its own sake. Turn their mind to spirit realms. One of the guiding principles I discovered early in my studies of psychotherapy is that "understanding is the booby prize." What is meant by that terse statement is that what happens in psychotherapy is not always known by the one being helped and is not necessary for it to be known in order for it to be effective. In fact, it is often deleterious and unhelpful for the one being helped to have a full understanding of what happened. I used to say to my clients who asked for an explanation, "Would you rather leave here without your problem totally confused, or with your problem and have a complete understanding of what happened here?" No one ever chose the latter option. In this next passage Steiner has similar words to say about Christ's deed on Golgotha and what that deed has brought to humankind, namely, that it is not necessary for us to understand it fully for it to work in and on us. [page 50] If Christ had worked only on the basis of what men have been able to grasp of him, he would have been able to achieve little. But what matters is not what has entered into mankind through human reason and understanding, what concept men have been able to form of the Christ, but rather the fact that he has been present since the Mystery of Golgotha, active right among men and in their ways of doing things. It is not a question of how far men have understood him but that he has been present as a living entity and has entered wholly into all significant events in evolution. One example Steiner gives involves a turning point in the acceptance of Christianity as a religion by the State, namely the conversion of Constantine. Shortly before his battle at Saxa Rubra on October 28, 312, Constantine had a dream in which he was told that he would win if he led his troops in battle under the sign of Christ." That victory led to what was to become the Holy Roman Empire. And yet in those souls in West and South of Europe it was not possible for them to get their minds around Christianity, no, "They had to find the way to Christianity through what had been created around them, externally. We may say that they assumed Christianity like a garment. Their deeper nature was not greatly affected by it. . . . They needed to assume Christianity as a garment, to wear this garment of Christianity in such a way that they wore it in their ether bodies and not in their astral bodies." (Page 53) Wearing Christianity as a garment, they had to discard it upon death as it dispersed with their etheric bodies. 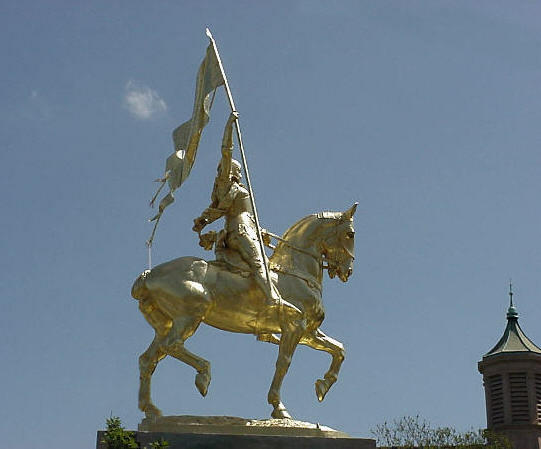 One of the finest statues in my home town of New Orleans is a golden equestrian statue of Joan of Arc, Maid of Orleans. It is covered with a brilliant gold and has her banner flying overhead as she heads into battle at the front of the French troops against the British invaders of her beloved country. We know the history — the dispirited French troops are enlivened by her example and drive the British forces back onto their small island. These victories gave the French a free hand in Europe, and importantly kept the British out of Europe during this same time period. And more importantly for the British, their domain became the world outside of Europe, a change of focus that led to the British Global Empire, "upon which the Sun never set" at one point in its history. Steiner adds to these insights the salient fact that Joan had zero comprehension of this larger picture and yet events took place which created the current form of Europe with her invaluable assistance. Steiner reveals an interesting fact about Joan of Arc's birth, that she was born on January 6, 1412, a date that my Encyclopedia Brittanica has only the year as approximation. He explains that she was to be born exactly one sun cycle (2,160) years after the founding of Rome so that the "Inspiration of pagan Rome" could "come in through the aspect of man that is most utterly childlike." [page 71, 72] This means that the soul of Joan of Arc had to be taken hold of at the point where souls are taken hold of most profoundly, where they are weakest in relation to earthly things, and where the Christ impulse is not yet hampered by worldly impressions — the souls not yet having taken up the earthly element, so that the Christ impulse can be the only one to enter into the soul sphere. The most favourable timing for this would have been for the Maid of Orleans to have gone through the time of the Thirteen Nights in her mother's womb immediately before her birth, before she took her first breath. And indeed, she did — for she was born on the 6th of January. New Orleans, where I live, has a long-time tradition that begins on January 6, also called the King's Day — it is known as the King Cake. This is a ring cake that is decorated and contains a tiny baby, originally porcelain, now plastic. 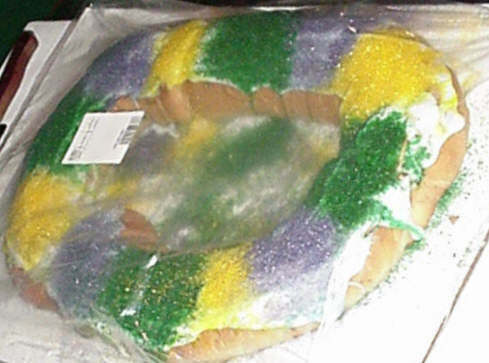 The local legend is that anyone who gets the piece of King Cake that contains the baby has to buy the next King Cake. King's Day is the day after the Twelfth Night since Christmas and marks also the local beginning of Carnival season which proceeds until Mardi Gras, Fat Tuesday, the last day before the fasting and abstinence of the Lenten season begins. I find it most interesting that the patron and eponymic saint for this city was born on this propitious date of January 6. A saint who was to shape the future structure of the world by the infusion of the Christ impulse into her. Luciferic powers held sway during Joan of Arc's time, but for our time, it is Ahrimanic forces that hold sway. To counter these forces we must encounter spiritual science and endeavor to make the world around understandable, rational, and filled with light. To do that we need the help of the Michaelic spirit in our time "so that we shall indeed become strong enough to face the Ahrimanic forces." [page 77] Sun-like qualities are called for in the age of Michael, qualities we take into ourselves by spiritualizing the power we have at our command between waking up and going to sleep; the powers of the intellect, of understanding, of insight. For these powers of understanding we possess will undergo a transformation in the soul if only we have sufficient patience. Steiner says on page 80, "everything the study of spiritual science has to offer is merely preparatory." This reminds me of what Michael Faraday said to a lady who scoffed when first seeing his prototype electric motor, "Of what use is that?" "My dear Lady," Faraday replied, "Of what use is a baby?" [page 80] One day an awakening of the soul will spring forth from the study of spiritual science, and the soul will know: Within you lives the spiritual world, from the Christ impulse down through Michael to the folk spirit which puts into effect what has to be put into effect. [page 89] The moral power of a person has exactly as much to do with his nervous system as I have to do with the floor on which my feet are now standing. If the floor were not there, nor the ground on which it rests beneath it, I would be unable to stand here, being a physical human being. The floor has to be there, but it has nothing to do physically with anything within me. The floor or the ground has to be there for me to stand on. In the same way the nerves have to be there in the physical body merely to provide the physical resistance which the moral powers of the astral body and the ego must encounter in the physical world in order to make their presence felt. Few people have begun reading Rudolf Steiner without this question popping into their heads. On page 92, Steiner shares the question with us this way: "People find it very easy to say: 'When I get you to tell me of the supersensible worlds how can I know that all these ideas are correct?'" He goes on to answer his own question by saying that even if someone were spreading the wrong ideas about the supersensible worlds, it would still be "better for people to have taken up the wrong ideas than to have taken up no ideas at all concerning the supersensible world." It seems that just like with meditation or physical exercise, even doing it the wrong way is better than not doing it at all, because there is a net benefit to us from the attempts. [page 92] Why? It would have been better because the soul has to make an effort in accepting any kind of idea about the supersensible world. You may take up correct ideas or incorrect ideas but you have to make an effort, and it is this effort which counts in the spiritual world when we go through the gate of death. It is this effort that will benefit us after death or, indeed, benefits us altogether when we enter into the spiritual world. The next concept is crucial to understanding what happens when a young person dies. The ether body is used up in the course of a lifetime which leads to its forces dissolving quickly if one dies at a very old age, and less quickly if younger. If a young man dies, his etheric body "could still have served him for many years" and "will not dissolve immediately." [page 94] It will separate from the astral body and the ego and these will go their own ways in the spiritual world. The ether body will separate from them, but it will not dissolve immediately. It will seem quite natural to you that the human being maintains a certain connection with the ether body which has separated immediately but still continues to be present in the spiritual ether. We are therefore able to say that the sphere of this spiritual ether — taking it in absolute terms, close to the earth's aura — contains a very considerable number of unused ether bodies, ether bodies with vigorous forces. It is particularly impressive to see, when observing the spiritual world as it is at the moment, that we find there such a large number of unspent ether bodies. Steiner has spoken on many times of the benefit of reading to the dead, saying that when we do so it is like giving food to the one who has died. Usually reading to the dead is done to those we know personally who have died, but Steiner makes the point on page 95 we will be able to "read out into the unknown" to thousands who have died with great effect using the poetic prayer or mantram he gives us on page 32 above. [page 95] Having used this mantram with true reverence we are then able to read out into the unknown, as it were. 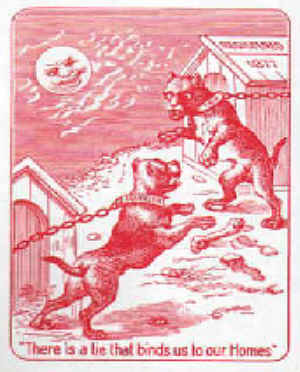 Dead people who have gone to their death in consequence of the events of the present time will be able to receive this. They will be able to gain benefit from this connection with us and use it to influence cultural developments on earth through their ether bodies. They will be working together with the people living on earth to advance spiritual life. Once again in this next long passage, Steiner speaks to us about the current world situation where a huge loss of life has occurred, a war is in progress world-wide, and each side is blaming the other for starting it and keeping it going. What a senseless destruction of life and property, one might think. What possible good can come out of such a sorry state of affairs? Not much — when viewed from a purely materialistic point of view. Let's see how it looks from where Steiner is sitting. [page 97, 98] This is the thought which should fill the hearts and minds of those who suffer great losses: Our age desperately needs to become spiritual, and this will be possible only with help from the spiritual world. The means of providing such help have to come out of painful events like those we are now living through . To the spiritual scientist it is immediately obvious that these events should not be considered from a materialistic point of view only. Yet a materialistic way of looking at these events is about all one can find. It may happen — and we have seen it happen — that a number of people in one part of the world feel that there is hostility towards them and therefore issue some form of proclamation. This proclamation reaches enemy territory and from this enemy territory the question is put: 'Who was it who wanted this war?' Or the other party is accused of having wanted the war. Again and again they forget the one thing which must be understood if a deeper insight is to be gained from the situation. It has to be understood that all these events are indeed willed out of the spiritual world, because the spiritual world needs the powers that may be the fruits arising from the seed of those unspent ether bodies . If accusations were to be levelled one would also have to level them at the spiritual world. But there all thought of blame goes from one's mind. There we become aware of the iron necessity which exists, the iron necessity which from the point of view of the spiritual worlds, has to regard our earth world in about the same way as we have to regard a situation where it is necessary to consume so and so much, kill it, take it out of its natural context by force, in order to do something else. We cannot build a house unless we destroy so-and-so many rock formations. There is no point in speaking of blame. We have to speak of necessity in this case. And, in the same way it is necessary in the spiritual world to demand the sacrifices that are now being demanded because the seed is needed. This seed consists in the unspent ether bodies which will then be present in all that develops for humanity , and these have to be available if evolution is to proceed. Otherwise mankind would lack the energies it needs to progress. Anyone who's ever seen The Brothers Karamozov movie is left with the impression made by the nervous, twitchy son. Steiner says that what Dostoevsky has "mainly to offer is a very nervy, twitchy art, however great." Such art is a natural outcome of materialism. Most of what is called modern art since Steiner's time can be considered to be "nervy, twitchy art, however great." It is an apt description for everything from the cubism of Picasso, the optical machinations of Victor Vasarely, and the splash art of Jackson Pollack, among other things. [page 102] In a situation where mankind is in danger of going all twitchy, spiritual science comes from the other side to offer a cure. In his time, eighty years ago, Steiner noted that nervous symptoms were on the rise, and he knew that it was not the nerves that were at fault, like the floor of his metaphor above, the physical nerves were as strong as ever, but the problem was with all the twitchy stomping that humans were doing upon the floor that threatened to destroy the floor. Sounds like some of the popular dances of today, doesn't it? He offers an almost tongue-in-cheek a prescription to cure the nervous problems of humankind, "Take a book on spiritual science for three-quarters of an hour every day and try to think it through; this will make your nerves much stronger." And he sees a time coming when "prescriptions are written on the basis of spiritual science," but admits that is a long way off. [page 102] For a long time to come it will be thought that there is sufficient evidence to show that any kind of therapy that could be labelled 'mystical' is claptrap. The label 'mysticism' will be all the more freely applied the less people know what mysticism really is. We are the ones who use the term 'mysticism' least often. We use it only as a technical term. On the other hand, it is used most of all by people who have no idea as to the nature of mysticism. Steiner tells us on page 122 that a soul that has gone through the gate of death does not suffer from lack of consciousness, but an excess of it, rather like someone who has gone from a darkened building into the bright sunlight. A gradual subduing of consciousness must be achieved to be able to discern our own essential nature. [page 122] We have to be able to look back upon our own essential nature to find the guide-lines, as it were, for an orientation in the spiritual world. Lack of self-knowledge is what hinders conscious awareness after death. We have to find ourselves in the flood of light. And so you see why a need arises to characterize the person who has died, to assist them to find themselves. This is an excellent reason for the tradition of giving eulogies at a funeral service, for what is a eulogy if not a characterization of the person who has just died. Albert Einstein developed his theory of relativity by a thought experiment in which he imagined himself riding on a beam of light — he in effect became a beam of light. In light of what Steiner has to say about the spiritual world in the next passage we may understand what Einstein did was to enter the spiritual world when he became a beam of light. [page 144] It is not possible, for instance, to see objects illuminated by light in the spiritual world. If must be understood that in the spiritual world we ourselves shine forth with the light. When light falls on an object in the physical world the object becomes visible to us. In the spiritual world we ourselves are inside the ray of light, touching the object with the light. . . . We know ourselves to be alive within the weaving of thoughts. . . . For thought arises from light. Thought weaves in the light. When I was a young man in my twenties and thirties I had a lot headaches. Hardly a week went by when my head didn't ache. I tried all sorts of relaxation techniques, etc, and still I had headaches, not the splitting migraine types, just the dull, painful kind. What I read in the next passage about headaches accompanying a close union of the astral body and physical parts of the head makes good sense for what my life was like during those years. Steiner tells us that the head is the part of the human body that is essentially asleep between waking and going to sleep. This is certainly contrary to popular belief, isn't it? The reason is that when we are awake the ego and astral bodies remain outside the head and are mirrored by our skull’s physical and etheric nature. This is the normal process. Think of the process like looking into the bathroom mirror – if we get too close to the mirror, we cannot see anything useful. Likewise, if the astral body gets too closely bond to the physical and etheric parts of our head, then we are unable to think — we develop a head-ache. [page 151] A close union between the astral and the physical parts of the head occurs only when we have a headache. If we have a powerful headache, the astral, physical and ether parts of the head are very much united. We are least able to think when we have a headache. In my review of The Riddle of Humanity I first came upon the concept from Steiner that the head incorporates into itself the limbs of our previous incarnation. I developed the "dashboard" metaphor to explain that to myself -- how the instruments on the dashboard of an automobile are localized indications of the condition of remote parts of the automobile. With each new generation of automobiles, more and more parts of the automobile are brought via reflection by instruments onto the dashboard. Thus the dashboard to the automobile is like our head to our bodies. [page 152] But the rest of the organism has not yet progressed as far as the head; it has not yet reached a point where it reflects the way the head is able to reflect. [page 152] It [thinking with hands] will be achieved as mankind develops further in the course of earth evolution and grows towards Jupiter. Then his hands, his physical hands, will in fact become immovable. On Jupiter human beings will no longer have physical hands that are mobile organs, for they will be fixed. . . . Only a trace of physical hands will be left on Jupiter and they will be immobile; the astral or ether hands on the other hand will be able to move freely, like wings. As a result, Jupiter man will not merely think with his brain, for his fixed hands will enable him to reflect into the elements now united with his physical hands. His thinking will be much more alive, much more all-embracing. When a physical organ comes to rest, the spirit or soul element belonging to it will be liberated and able to develop spiritual and soul activity. During the Jupiter Epoch which will succeed our current Earth Epoch, our thoughts will have wings when our hands become immobile. There is something very beautiful about that thought. To be consistent, if our brain once moved like wings, it must not have been able to think as we do now. And that is exactly what was the case for human beings during the previous Old Moon Epoch which immediately preceded our current Earth Epoch. [page 153] When we were still living on the Old Moon we had organs up here [the cranium[ that moved like hands. These organs have become fixed. On the Old Moon we did not yet have a solid cranium; the organs now folded up to form the brain were then able to move like hands. Because of this, men living on the Old Moon were not yet able to think the way men do on earth. Once our brains moved like wings. Our hands and arms move like wings. Our thoughts will take wing without arms. When we think of evolution, we are used to thinking of long periods of time before any progress is made. Steiner tells us that our ego evolves, grows more mature during a single lifetime. [page 174] We also progress between birth and death here on earth, for our ego grows more and more mature, gaining experiences about the world. A young person cannot have learned as much as someone who is older. The same applies to the spirits of the hierarchies, except that their evolution proceeds somewhat differently than our own. Just as our ego develops during our individual lifetime, the human ego is undergoing continuous development and evolution during our current Earth Epoch. In this next Table we can see that our three earlier bodies, the physical, etheric, and astral bodies completed their development during past Epochs and brought into fruition the human processes of remembering, thinking, feeling, and willing. One must think of each Epoch as spanning eons of time during which each body was undergoing continuous development. One cannot have undergone such tremendous development without some remnants of that development remaining within, and in fact, that is the case. Our ability to remember is a vestige of our development through the Old Saturn Epoch which acts as an organ of memory within us today. "This may be perceived as a genuine entity into which the ether body is able to enter the signs which record the experiences that come from the outside, to recall them again in the process of remembering." The impact this realization has upon the human organism is great, and requires that we apply this understanding in the development and education of our children. It is the foundation of a principle applied in Waldorf Education, and, sadly and unfortunately, under-appreciated by the public school systems, up until now. [page 189] Essentially, man owes this subconscious recording faculty to the fact that his body, and specifically the element within the physical body which is to receive those imprints, is still pliable during the first seven years of life. It is therefore important not to subject children to forced memory training. I have drawn attention to this in The Education of the Child. During the first seven years the still pliable organism should be left to its own elementary powers and we should not use coercion. We should tell children as much as we can but not attach too much value to artificial memory development, rather leaving the child to itself where memory development is concerned. This is a point where spiritual science is of tremendous importance in educational life. I note the advice to avoid coercion before seven is to be applied only to the process of memory, not to the other areas of discipline. Too often, this advice against coercion is applied to the general area of child-rearing and causes great damage to the child who is left like a ship without a rudder, or rather without a captain on the bridge during the perilous passage through the straits of childhood while their inner captain is being trained to take over on the bridge. The two faces of the Devil are Lucifer and Ahriman. One easy way to make the distinction between the two is to think of them as representing the two extremes of art and science. We obviously cannot get away from art or science and still be a full human being in society. Neither can we get away from Lucifer or Ahriman — we would become like "a pendulum that does not swing." It is only with the help of Christ that we are able to keep swinging in a balancing act between the two disparate forces of Lucifer and Ahriman. [page 203] All art not fully penetrated by spiritual science is Luciferic and all science that is not spiritual science is Ahrimanic. In a discussion of Goethe’s work Faust Steiner talks about a scene in which a door opens and in comes Wagner along with the earth spirit. Steiner asks, "What exactly does Wagner represent?" and gives this answer, which indicates that all knowledge is personal. [page 204] We know that all knowledge gained of the universe is knowledge gained of oneself. It is a part of Faust himself that enters with the earth's spirit, though it's part of the expanded soul that identifies with the cosmos. Faust, however, is as yet unable to understand it. He cannot yet reach out to that element which is also a part of himself. My Matherne's Rule #36 says "Remember the future. It hums in the present." This process which I discovered for myself many years ago and have used successfully began to glow with new meaning when I read the next passage by Steiner. To understand what he is saying one must understand that images which are stored of one's present life and past history in one's etheric body provide the building blocks of dreams. When we dream, our ego and astral bodies are returning to our physical and etheric bodies — they have just experienced something that will only take place in the future, perhaps in the person's next incarnation — and as they approach and brush against the etheric body, they trigger dreams that are quickly assembled of those building blocks of images of present and past life experiences. After such a dream, one might say, "I just had a dream about something that happened years ago." But what has happened is that the future is interpreted in terms of the past images. The astral body carries the feeling, the "hum" if you will, and the hum is core of the revelation of our future. This hum triggers an up swell of images from our previous life that are consistent with the hum. You see someone to whom you will be married happily for 57 years and you will feel this "hum" and you call it "love at first sight." You put on a ring that will be your engagement ring for the rest of your life and you feel a zing! and suddenly you know that this is the ring for you. All these are examples of remembering the future. The process that works while one is dreaming also works while one is awake. [page 214, 215] When the astral body enters, the ether body expresses what really is part of a future life in images belonging to the present life. This peculiarly complicated process actually takes place all the time in the human being when he is dreaming. . . . As we gradually learn to separate our dreams from the images deriving from our present life, we come to know the prophetic nature of dreams. . . . We need to consider the nature of the experiences in our dreams rather than the actual experience. . . . We have just come to see that there is a foreteller of future lives within us. when you try on a ring? The answer is in the zing! We are but babes in school. and loving you for tomorrow's sake. And things are not as they seem. so very wiser than I. And took up in us his home. [page 220] Into our dreams however come the Inspirations of the angels, of the entities known as Angeloi. These in turn are inspired by entities from higher hierarchies. Into our dreams enter things — more so in some and less in others -- that are more sensible than anything we have gained from everyday life, anything we encompass in everyday life as we think, feel and use our will. The element that guides us, the element which is more than earth-dwelling man is or ever was, enters into the dreamer in us. In addition to the dreamer or Moon Man, we also have a Sun Man left in us from the Sun evolutionary stage or Old Sun Epoch. That inspired another poem in me which appears directly below the passage that inspired it. [page 224] This Sun man, however, is no longer able to dream. His conscious awareness is of the same kind as that of the plants. We have within us a plant of Sun man, who is asleep. And then we have in us a Saturn man who is completely dead, as dead as a stone. And sleeps the livelong day. And breathes an elemental breath. If we look at an avocado tree with avocados hanging from its branches, we know that the tree has within it the potential for its next life — that is, within each avocado fruit is the seed that can grow and mature into a new avocado tree. We know this because we learned about the birds and the bees, about biology and reproduction. But did anyone teach us, before Steiner came along, that within ourselves we have a seed that contains the potential for our next life exactly parallel to the avocado tree, but at a human level? [page 236] In fact, we already have within us during our present life the potential for our next life; this will be the fruit. If we were always able to catch hold of this element we become immersed in, we would catch hold of much of what we will be in our next life. So there is billowing, weaving life down there. It is the germ of our next incarnation and this is what we take into ourselves. Hence the prophetic nature of our dream life. This passage inspired the final poem in me before I finished the book. and grows into an avocado tree. and grows into a future we. This has been a powerful book, a powerful series of lectures for our time as much as it was for Rudolf Steiner's time in the early days of the Great War in 1915. Almost a hundred years later we find ourselves living in a world in which nations are aligned across a cultural divide in a face-off with destiny. Certainly the destinies of individuals and nations are at risk during this perilous time. Danger reaches into every neighborhood of the globe, not just on the battlefields as in that earlier war. As I read this book over a three months period in the fall of 2002, there were times when I was only able to read a page or two before some Inspiration welled up in me that required expression. If you asked me to name one book that you should be reading to understand the times we live in today, I would recommend this one. [page 243, 244] Let us use all we have been able to absorb out of the work we have been doing these last years and try to understand clearly that there is a certain measure of spiritual power that is given to human nature. Mystical spirituality has to be thrust out of human consciousness in order that mankind can grow free in taking hold of the physical Body. Yet on the other hand this mystical spirituality must be made part of our conscious life, otherwise Ahrimanic and Luciferic powers will take hold of what has been thrust out from conscious awareness. . . . In closing here is the two-fold prayer exactly as Rudolf Steiner prayed it with his audience at the beginning of each lecture in this book back in the perilous days of 1915. Can we do any less today? Turn their mind to spirit realms." 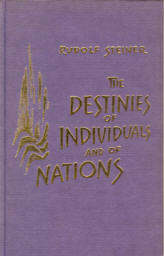 I read Bobby Matherne's review of "The Destinies of Individuals and of Nations," by Rudolf Steiner. After a slightly uncertain beginning, I became sincerely impressed not only with Steiner, but with Matherne's ability to put Steiner into a modern context. This wasn't an easy process to go from slightly unsure and turned off by the whole thing to whispering "amazing." I just want to touch on the points that struck me the most. Matherne said: Steiner's simple operational definition of evil as "a good out of its time." It's a provocative idea. And then, his explanation illustrates it further. He says Lucifer brought life to Earth at the wrong time, and thus brought all subsequent evil to the Earth. Matherne states, "Paradoxically, we learned about love by playing at war," when he describes his friends and him playing backyard sports. The next point I want to include in my "magic" or really amazing insights I'll try to paraphrase, even though I want to copy the whole thing here. What we most earnestly fight against is what we love deep down. When one engages in an act of fighting, one transfers energy/power to the other person. Generally, we would believe we only transfer energy or power to people we genuinely and outwardly love. Examples include a grandfather teaching a grandson to fish or a mentor passing on his wisdom. With this understanding, every fierce battle transfers power to the other. The hate that leads to the battle "can be seen at a deeper level to be the result of a deep love for the other to whom you will transfer this power," Matherne states. Amazing concept. And I know it to be true. Plus, afterwards he discusses Harry Potter and how Voldemort transferred some of his power to Harry on the night he tried to kill him. Plus, the series deals strongly with the idea of good versus evil and love versus hate. It is truly an amazing series. Then, Steiner goes a little bit of everywhere. Every heard of love at first sight? I thought so. Well, apparently one remembers the future during this moment. I know more than two couples who claim “love at first sight” and have been married for at least 50 years. Imagine that. They are happy and have numerous children and grandchildren and they are successful. They all describe it as love at first sight and that was it. That was all that was needed. This happens.